Arapahoe Libraries delivers library services to assisted living communities throughout Arapahoe County. The Mobile Library offers access to the full Arapahoe Libraries collection in addition to one-on-one assistance from our expert staff. 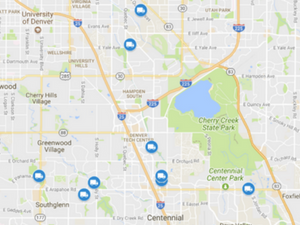 View a map of the assisted living communities we visit. NOTE: Items that are "on shelf" in the online library catalog may not be at a particular Bookmobile stop. Please call 303-LIBRARY (303-542-7279) to ask about the location of a particular item.